WebSpace uses two fundamental content types: pages and posts. These content types behave quite differently and therefore it is important to understand when to create a page or a post. Pages are static. They are a good way to publish information that doesn’t change much, like an About or Contact Us page. Pages are usually linked from the main navigation bar on the Homepage. Posts are dynamic. Posts are always associated with a date and are meant to update your audience. Posts usually show up automatically on your main site page, but this will depend on the theme you've chosen. From the Dashboard, hover over Posts on the left menu bar and then click the Add New button. The Add New Post screen appears. Enter a title for the post into the field at the top. Enter the body of the post into the text box below. When you're finished, click the Publish button on the right. Post formats - you may be able to style posts differently using the Format module on the right hand side. Read about post formats to find out more and view the list of compatible themes. From the Dashboard, hover over Pages and click the Add New button. The Add New Page screen appears. Enter a title for the page in the field at the top. Enter the body of the page into the text box below. 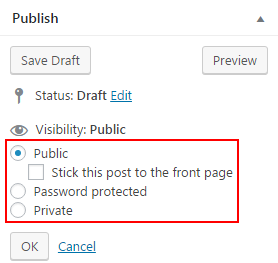 Pages and Posts are public by default, but you can also set them to password protected or private. Public: The page is accessible by anyone. Password protected: The page is accessible by anyone who enters the correct password. Private: Only visible to you and anyone you assign as an Editor or Administrator. Visibility of pages and posts may be overridden by site-wide visibility settings. For information on site-wide visibility refer to WebSpace - Security And Visibility, Restricting Access To Your WebSpace. 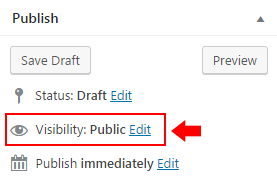 To change the visibility of a post or page navigate to the post or page from the dashboard and click Edit next to Visibility in the Publish block. Select the desired visibility and click the OK button. Your WebSpace site includes a media library that allows you to upload many common file formats such as images, word processor, spreadsheet, audio, presentation, and others. The maximum file size is 10MB and the total maximum space is 500MB. You are also able to upload video files, but unless you're able to compress them to under 10MB you are better off using a video hosting service such as YouTube. The following file types are supported: DOC, DOCX, ODT, XLS, XLSX, PPT, PPTX, PPS, PPSX, JPG, PNG, GIF, MPG, MP4, WMV, MP3, OGG, WMA, M4A, WAV, PDF. The media library allows you to track all the files you've uploaded, when they were uploaded, and what pages and posts they're attached to. 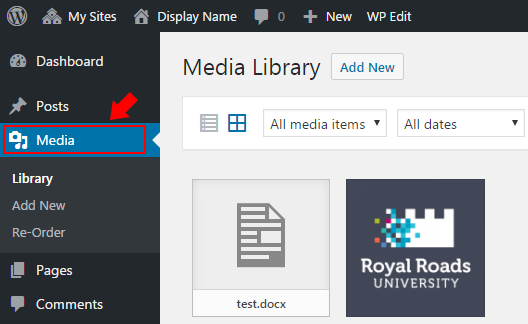 Access your media library in the dashboard under Media. Embedding of media such as an image, video, or audio means that the media is visible directly from the post or page. If it's a playable type of media such as audio or video it will be playable from the post or page. Linking means that the media is accessible after clicking on a link. The media is not visible or playable from the page or post. Media is usually linked from text, but can also be linked from an image. 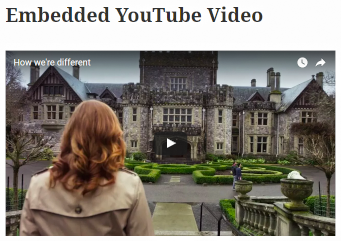 Click here for the Royal Roads University video on how RRU is different. Most common word processor, spreadsheet, and presentation file types can be uploaded to WebSpace including DOC, DOCX, ODT, XLS, XLSX, PPT, PPTX, and PDF. These files can be inserted into pages and posts in your site by using drag and drop. 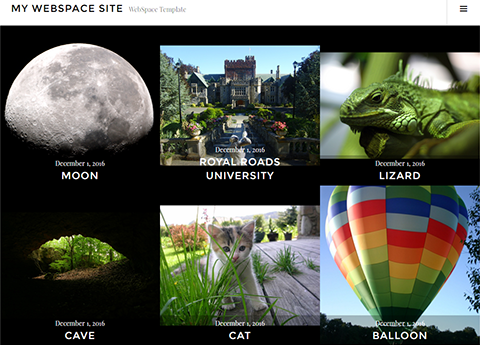 Store the image in your WebSpace media library and embed it in a post or page. In your WebSpace site, navigate to the page or post you would like to create or edit. Position the cursor where you would like the image to be embedded. Just above the text editor toolbar, click the Add Media button. Drag and drop the image into the Insert media window. You should see the new image appear, and it will be selected by default. Click the Insert into page button at the bottom right. When you have finished formatting your page, click the Publish button on the right. If you're using Cloudup, simply paste the link to the image into your post or page, and it will automatically be embedded. Copy the link of your externally hosted image. In the text editor toolbar, click the Insert/edit Image button. Paste the image's link into the Insert/edit image window. Add a description of what the image shows and what information the image is attempting to convey in the Image description field. Audio files such as podcasts can be added in the same way that images are added. The maximum file size should be sufficient for high-quality audio clips up to about 10 minutes. To ensure that your audience won't have problems listening to your audio clip, the file should be in MP3 format. If it's in another format, you can use this Online Audio Converter to convert it. You can also use the Online Audio Converter to reduce the size of the file. If your audio file is over the maximum size use one of the external hosting services. We recommend the video hosting services YouTube or Vimeo for video embedding. If you are hosting your video on another site such as Dropbox, the video will automatically embed as long as the link ends with a an extension for a common video format such as MP4. For example, pasting in a link from Dropbox with the following format will automatically embed https://dl.dropboxusercontent.com/s/gjw42y7et7b5xfh/Video.mp4. Navigate to YouTube.com and login if necessary. If the video you want to add is already in YouTube, navigate to the video and jump to step 7. Click on the Upload button in the top right corner. Set the privacy to either Public or Unlisted. Public means that the public can search for your video while unlisted means that the public can not search for your video. 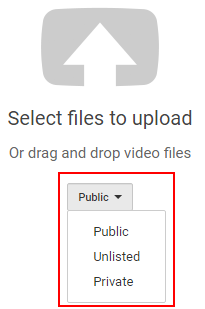 If unsure, set it to unlisted, as you can change it later. Drag and drop your video into the Select files to upload window. Click the link under Your video will be live at. Paste the URL into the text editor in your WebSpace site, and it will automatically display the embedded video. If you don't want to use a video hosting service such as YouTube and your video is under 5 minutes long you can likely reduce its size to less than the maximum size while retaining reasonable image and sound quality by using Handbrake. Drag and drop the video file onto Handbrake. Click the Browse button next to destination and give the output file a name. Under picture tab if if the width is greater than 1024, set it to 1024. Under the video tab, set quality to 24 (higher will produce a smaller file). You may link to other pages and posts, or to any media such as images, audio, or video. Select the text that you would like to link. Click the link button in the menu bar. Paste the link into the field and click the Apply button. Portability is how easy it will be for you to transition your WebSpace site content to another WordPress host. If you're interested in moving your WebSpace site to another WordPress host in the future, possible after you graduate, then you're going to be concerned with portability. Hosting all audio and video files externally will help improve portability. There are many sites that offer free hosting of media that you can use with your WebSpace site. Cloudup and Dropbox are highlighted here since either can host most common file types. Other external hosting sites that you already use may also work. Here is a list of sites that allow for easy embedding of content into your WebSpace site. Cloudup allows you to host documents, images, audio, and video files. The maximum file size is 200MB, and the service allows up to 1000 files. These instructions assume that you have a Cloudup account. Drag and drop your file into Cloudup, copy the link from the location bar shown below, and paste the link into your WebSpace post or page. These instructions assume that you have a Dropbox account, and will show how to add a file to your Dropbox account and then create a link to that file that can be used to embed content on your WebSpace site. Navigate to Dropbox. Login if needed. You'll likely want to create a folder to put your WebSpace content into. If so, click the New folder button at the top and give the folder a name. Navigate to the new folder by clicking on it. Drag and drop the file you wish to upload into Dropbox. Once the file is uploaded, click the Share button to the right of it. Paste the link into a text editor. Remove ?dl=0 from the end of the link. Paste the link you created into your WebSpace site. If it's an image, audio, or video it should automatically embed once you paste in the link. Categories and tags are indexing systems for your site. Categories are typically used to index your posts often using general taxonomies. Tags are typically more fine-grained than categories and are often used to link to keywords or details within a posts. Featured Images are images that are chosen as representative images for posts and pages. The display of these images is up to the theme, but it will often appear at the top of the post or page. This can be especially useful when using a theme that displays a preview gallery of posts or pages along with the featured images. While creating or editing a post or page, click the Add Media button. Click the featured image menu option. Select an image from your media library or upload a new one and then click the Set featured image button at the bottom right. 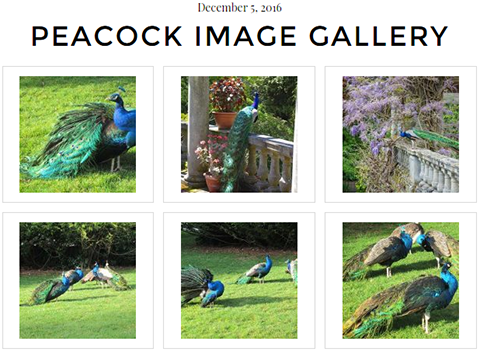 An Image Gallery will allow you to add a gallery of image thumbnails to your post or page. Click the Create Gallery menu option. Select all the images you'd like to add to your image gallery and click the Create A New Gallery button and then click the Insert gallery button. Selecting six images would result in something that looks like the following. Viewers of your site can click on the image thumbnails to see the full-sized images.